Herbig-Haro 110 is a geyser of hot gas from a newborn star that splashes up against and ricochets off the dense core of a cloud of molecular hydrogen. This image is a composite of data taken in 2004, 2005 and 2011, and was released July 3, 2012. A spectacular new picture from the Hubble Space Telescope has captured a cosmic fireworks display in deep space: a geyser of gas fired off from a baby star. The celestial display is the result of Herbig-Haro 110, a gas jet erupting from a distant star and bouncing off of a nearby dust cloud. NASA scientists likened the impressive celestial jet to the skyrockets launched each year in the United States to mark the Independence Day holiday on July 4. "Resembling a Fourth of July skyrocket, Herbig-Haro 110 is a geyser of hot gas from a newborn star that splashes up against and ricochets off the dense core of a cloud of molecular hydrogen," Hubble scientists said in a statement today (July 3). "Although the plumes of gas look like whiffs of smoke, they are actually billions of times less dense than the smoke from a July 4 firework." 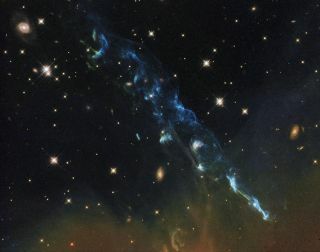 Herbig-Haro plumes are typically short-lived features of stars that usually last about 100,000 years. They were named after astronomers George Herbig and Guillermo Haro, who studied the objects in the 1950s. The objects are usually formed by twin jets of super-hot gas firing off a newborn star in opposite directions. But the Herbig-Haro 110 object comes with a twist: Scientists can't find the origin star responsible for the jet. After a detailed study, astronomers now think that the Herbig-Haro 110 jet is created by a completely different gas plume known as Herbig-Haro 270. As that other jet bounces off a cold, dense cloud of interstellar dust, it careens back into space in a 60-degree angle and reemerges from the cloud as Herbig-Haro 110, researchers said in the statement. "The jet shows that these energetic flows are like the erratic outbursts from a Roman candle," Hubble scientists said. Astronomers used the Advanced Camera for Surveys (ACS) and Wide Field Camera 3 on the Hubble Space Telescope to create the new view of Herbig-Haro 110. The observations were taken in 2004 and 2005 (with the ACS) and in 2011 with Wide Field Camera 3. The Hubble Space Telescope has been beaming amazing pictures of space to Earth since its launch in 1990. The Hubble telescope is a joint mission between NASA and the European Space Agency.